IQiyi employees and investors at the Nasdaq where the company's shares began trading Thursday. The Netflix of China had a tough first day on Wall Street. Shares in video streaming platform iQiyi (IQ) tanked on their Nasdaq debut Thursday, closing down more than 13%. The company raised nearly $2.3 billion in its initial public offering this week, pricing shares at $18 each. But by the end of its first day of trading, shares had slumped to $15.55. The timing was unfortunate: iQiyi made its debut in a week when investors had been dumping a lot of tech companies. But that doesn't fully explain the Chinese firm's opening-day plunge. Many tech stocks that had been hammered earlier in the week rallied on Thursday. Investors have concerns about how long it will take iQiyi to turn a profit, said Canaan Guo, an analyst at Chinese research firm Pacific Epoch. The company is locked in an expensive battle for users, fending off deep-pocketed rivals backed by Tencent (TCEHY) and Alibaba (BABA). They are all competing to win paying subscribers, spending big money on premium content like original shows. Investors often accept that fast-growing tech companies will lose money as they build their businesses. IQiyi said its revenue jumped more than 50% last year. But the fierce competition and heavy spending on content in China could make it harder for the company to become profitable, according to Guo. It lost about 3.7 billion yuan ($590 million) last year, widening from a loss of around 3.1 billion yuan ($490 million) in 2016. Some analysts are upbeat about iQiyi's prospects. 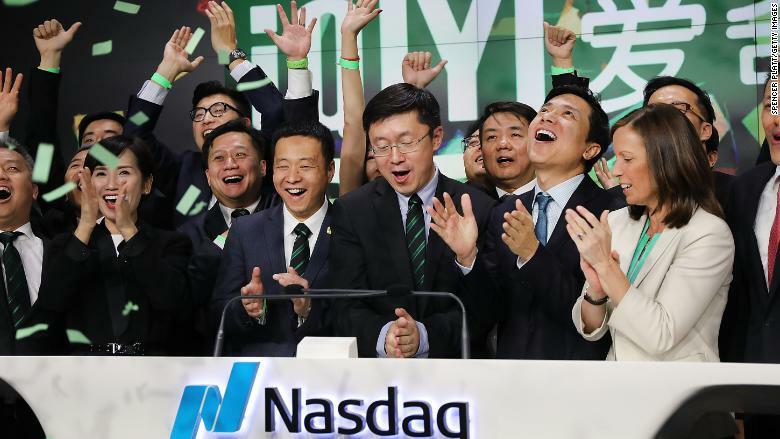 Investment bank Jefferies said ahead of the IPO that it valued iQiyi at $17 billion, far higher than the company's market value of about $11 billion after Thursday's close, according to FactSet. IQiyi is a unit of Baidu (BIDU), which runs China's biggest search engine. Analysts say that spinning off iQiyi will enable Baidu to focus on other priorities such as artificial intelligence. Before iQiyi's shares nosedived, Baidu CEO Robin Li called the IPO "an exciting day for the Chinese internet." It was the second largest IPO by a Chinese company in the United States after Alibaba's $25 billion listing in 2014. Baidu still owns most of iQiyi, so Li is unsurprisingly bullish on the video platform's prospects. He pointed out that 13 years ago, Baidu raised just $100 million in its IPO on the Nasdaq. "And today, Baidu stock is worth probably 85 times more than the IPO price," he said. "And I am hoping iQiyi will be worth many times more than the current iQiyi price."